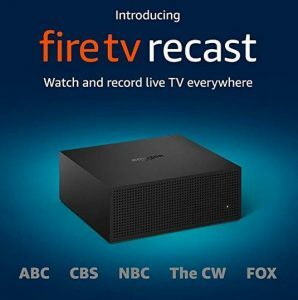 Amazon announced a new member to its fire tv line up, the fire tv recast. Fire TV Recast fills a void where many companies struggle to capture which is enabling streaming and recording for over the air broadcast. A lot of cord cutters, people cancelling their subscription to cable or satellite will find this extremely useful. Many streaming services such as Netflix, Hulu, HBO Go, Playstation Vue and even Amazon’s own Prime video lack the capability or service to stream live local channels. This product will enable this. The idea is this. The fire tv recast will plug to an antenna which will receive over the air HD signals from your location. That feed will go into your fire tv recast which can be streamed through to your fire tv devices (stick, tv, cube and show). Here is the kicker, it can even stream to your fire tv app! This will mean you can watch local and national channels (ABC, CBS, NBC, CW, Fox and presumably other local over the air channels) anywhere you have an internet connection. It also has DVR capabilities so you can save and replay TV shows. As this is an Alexa enabled device, you can use voice control to issue commands to open the channel guide or to record a particular show. Did I hear Sunday Football NFL? The only immediate negative feedback is the price. Compared with other fire tv devices, the starting price of $229 is a bit steep. At $229, you get 2 tuners with 500GB of storage which comes out to around 75 hours of recording. The more expensive option of $279, gives you 1 TB of memory which is around 150 hours of recording. I wouldn’t be jumping on this at this price point but would be interested in the prices at Black Friday.